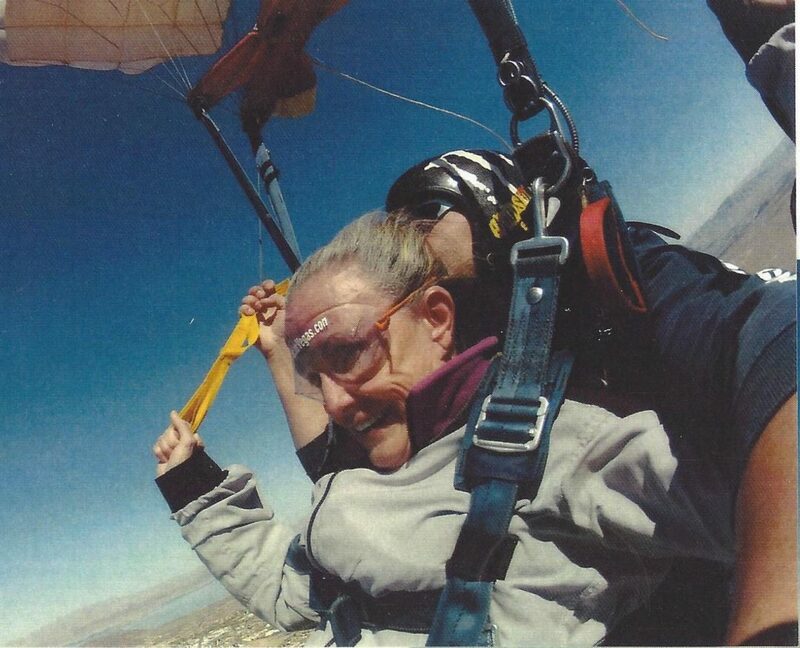 At Age 82, She’s Athletic And Adventuresome. And She’s The Legacy Of Her Ski Pioneer Father Founder Of Utah’s Sundance Resort. Barbara Stewart Anderson keeps going at 83. Her accomplishments prove her philosophy. She scuba dived the Great Barrier Reef, completed seven treks in Nepal, rode a yak in Tibet, heli-hiked in British Columbia, and reached the summit of 13,679 foot high Mona Loa in Hawaii. What makes it remarkable—she did it in her 60s. Looking back, Barbara grew up in the era of the 1930s, 40s, and 50s when women observed strict gender roles. But she was never strapped by the expectations of society. Instead of feeling suppressed or confined, she picked up speed. She has always been a woman ahead of the time. Her list of accomplishments keeps growing. Just 5 years ago, she sky dived, and she also summited 19,341 foot high Mt. Kilimanjaro, the highest point on the African continent. She was 76. Her passion for unbridled outdoor adventures began when she was a youngster. Her family homesteaded in the beautiful North Fork of Provo Canyon. Her dad, Ray Stewart, built a little cabin near the base of Mt. Timpanogos. During the summers, Barbara and her siblings roamed the hills and hiked to the waterfalls. It inspired Barbara to a life of over-the-top outdoor adventures that continues to this day. During WWII, the little Stewart cabin became headquarters for training the Civilian Defense Ski and Mountain Corps—sort of a civilian version of the military’s 10th Mountain Division. In addition to first aid and other skills, ski pioneer Stewart taught the recruits how to ski. And that fanned their enthusiasm to continue skiing after the war. 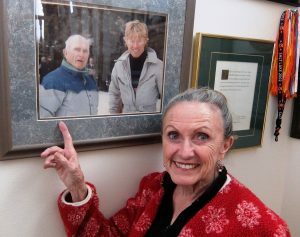 Barbara with photo of dad Ray and Robert Redford. When the war ended, Stewart, along with legendary skier Junior Bounous and others from the Defense Corps, cobbled together a rope tow. Stewart bought 1,200 feet of new manila rope for $61 and an old truck for $125 to power the tow. Using written instructions, he learned how to splice the rope into a loop — and it worked. It was the first ski tow in the area. The tow created new challenges for the whole family. As the oldest child, Barbara was often called on for help. The tow was powered by car batteries, and nine-year-old Barbara helped her dad the lug heavy batteries on and off the mountain so they wouldn’t freeze at night and lose their charge. She also learned to run the snack bar, punch ski tickets and help skiers onto the tow. 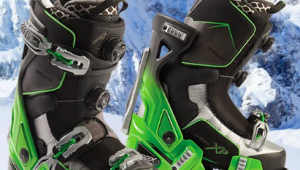 It was all part of growing up in a ski pioneering family. As skiing quickly became popular, they built a 50-meter ski jump and raced on the Mt. Timpanogos glacier in the summer. In 1948, famed skier and Olympic coach Alf Engen set the Giant Slalom course on the Timpanogos glacier. The event drew notable racers including Jack Reddish, Dev Jennings, Corey Engen, and Olympian Suzy Harris. Ray Stewart modified skis so young, energetic Barbara could ski on the glacier too. By the time she was 12, she was winning junior ski tournaments in Downhill, Slalom and Cross Country. The burgeoning little ski area grew, and it was named Timp Haven. Years later Robert Redford bought it, and it became Sundance. Stewart was inventive and creative with a passion for tackling the difficult and never giving up. Today, ski pioneer Ray Stewart’s name lives on at Sundance. The main lift is named for him: Ray’s Lift. Now at 82, Barbara is an icon of taking on challenges and achieving results much like her dad did. She skis regularly with the Sundance Seniors, walks three miles a day, works out at the gym, took first place in a 5K race, and is active in her church and community. Nothing stops her. Many would be exhausted trying to keep up with her. 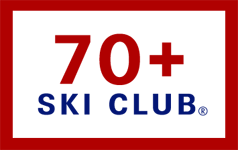 Over the years, Barbara built a collection of more than 600 miniature skier figurines that are on a rotating exhibit at the Alf Engen Ski Museum at the Olympic Park in Park City. Visitors can also learn about avalanches, sit in a real bobsled, try their knack at interactive ski jumping, and more. The $10.5 million museum was funded entirely by private donations, including donations from Utah’s famed and philanthropic Quinney and Eccles families. There is no admission charge. Visit and enjoy the museum. To read more from Harriet click here for her stories on SkiUtah. Barbara sky diving. Quite a selfie. Harriet Wallis has been a ski writer, editor and photographer forever. She learned to ski on a dare when she was in her mid 30s and has been blabbing about it ever since. Her work appears in regional and national print and online publications. Ski Utah named her Journalist of the Year. 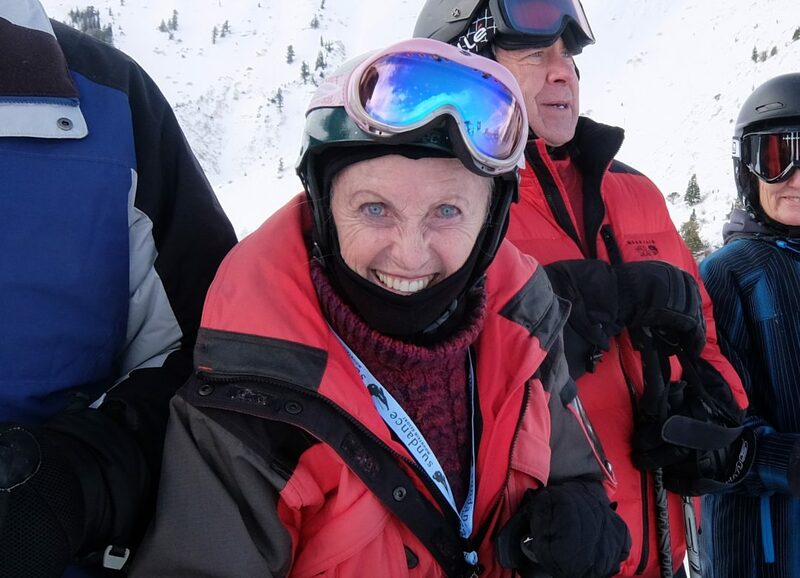 She's a senior-age skier based in Salt Lake City and she enjoys nearly a gazillion ski days each winter. She also enjoys two stainless steel knees. Harriet loves to be outdoors, so during other seasons she swims, bicycles and kayaks. She also single handedly rips up her yard, converting it to an arid and low water landscape with indigenous plants that she propagates. Skiing is a lot easier! Harriet I just skied with Barbara yesterday Mar. 8 at Sundance. She told me that her knee was tweaked a little from a fall while she was skiing with our Senior group last week. But did that stop her..no way. She was true to form and did well. She never gives up and like you said she is like the Duracell bunny, she keeps going and going! Thanks for this nice tribute to her. I hope when I reach her age I’m still skiing. She is truly an inspiration to all of us. I’m 62, 2 wk after my second knee replacement (other knee Dec 2016). A level 5-6 skier, skied one week in Jan this year. New knee felt great. Looking forward to getting back on the slopes next year. I would like to get your feedback on what terrain you are skiing now and what your process was for moving to more difficult terrain. I don’t think my prior “push it till I fall” approach will be the best one this time! Thanks for the great article on Barbara. Enjoyed it.